Sunspots have been rapidly waning too. Price action in US equities has been up and down this week, but there has been a more pronounced trend change in European indices. 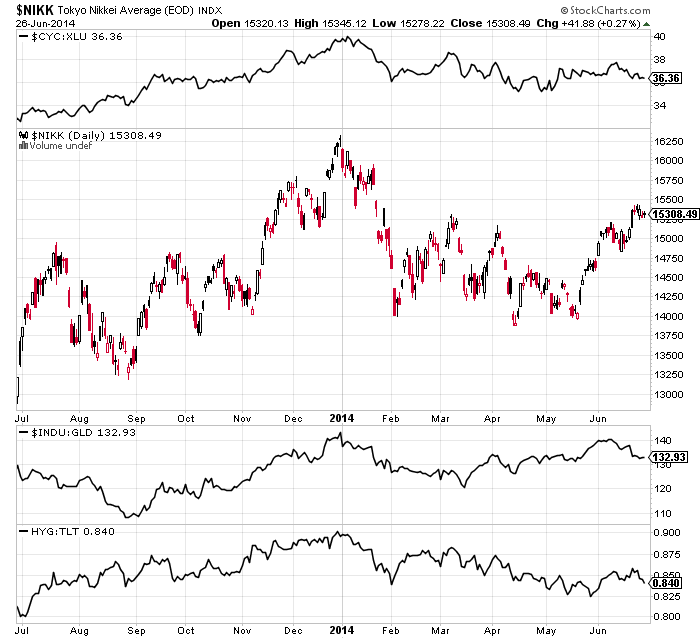 Meanwhile, precious metals have consolidated their breakout and treasuries have advanced again. 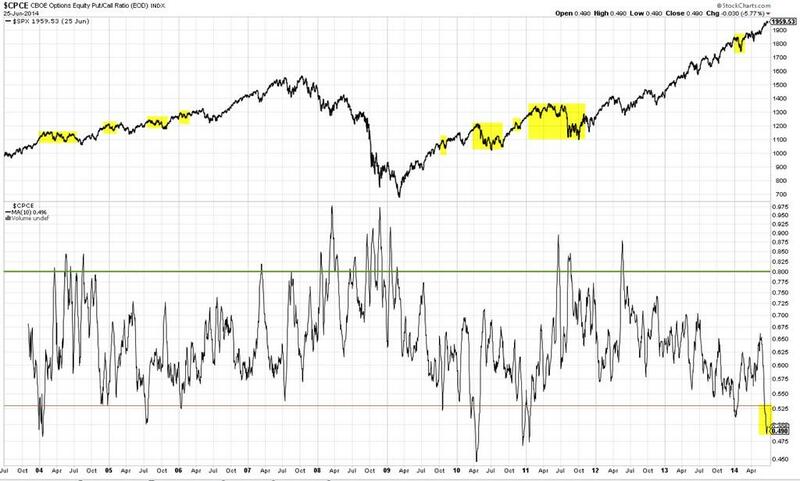 Bears have largely capitulated, as evidenced in readings in Investors Intelligence, NAAIM, Rydex, and more, whilst complacency is extreme, as evidenced by put/call ratios, Vix and more. Whilst the Sornette bubble continues to flag as ripe to pop. The US indices are ideally placed to turn, with the Nasdaq Composite at a double top, and RUT and IBB at potential lower high second chance peaks. 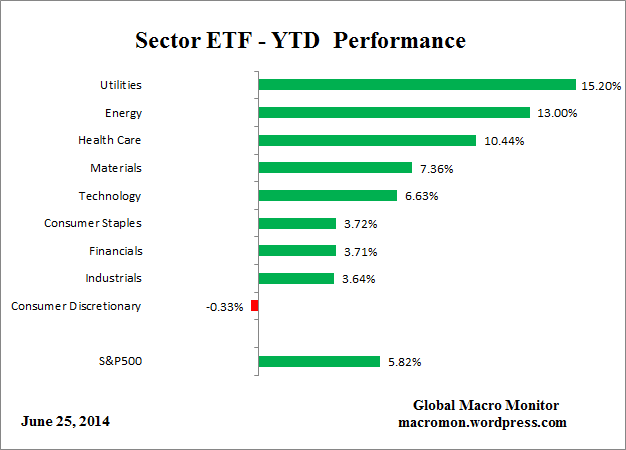 Equities have frontrun a return to ‘normal’ growth in both the economy and earnings, yet neither are occurring. Earnings season beginning early in July has the potential to add to the GDP disappointment and help cement the doubt and feed a downtrend. 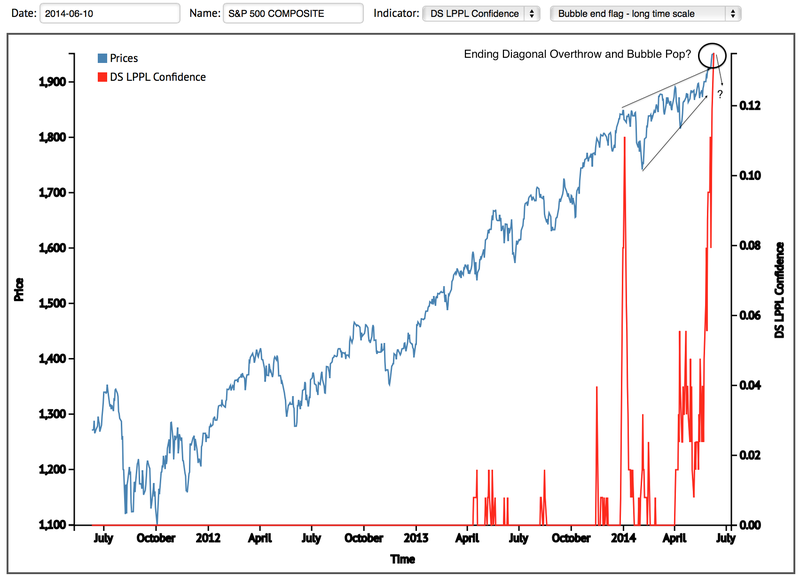 To add to all the above, various divergences and indicator flags are mature. I maintain the reason for price advancing despite all these headwinds is the solar maximum driving speculation. 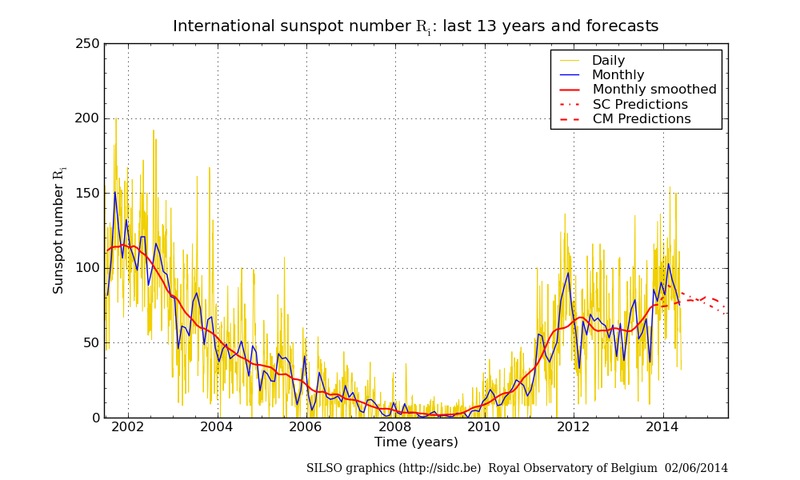 If price continues to advance from here then I suggest the solar maximum isn’t done. However, evidence still points to the smoothed max likely being behind us, befitting peaks in markets spreading from December to June, around a Feb/Mar centre. 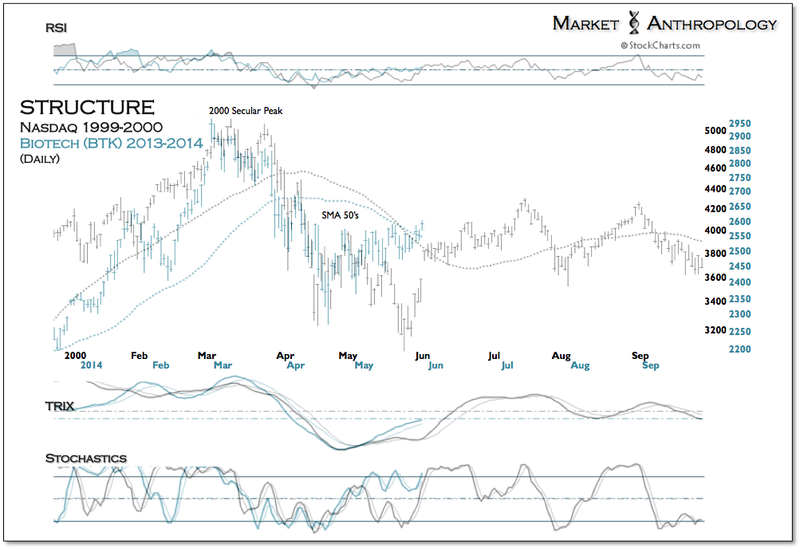 If so, equities are ripe to fall here and deliver the potential of the combined above set-up. 1. 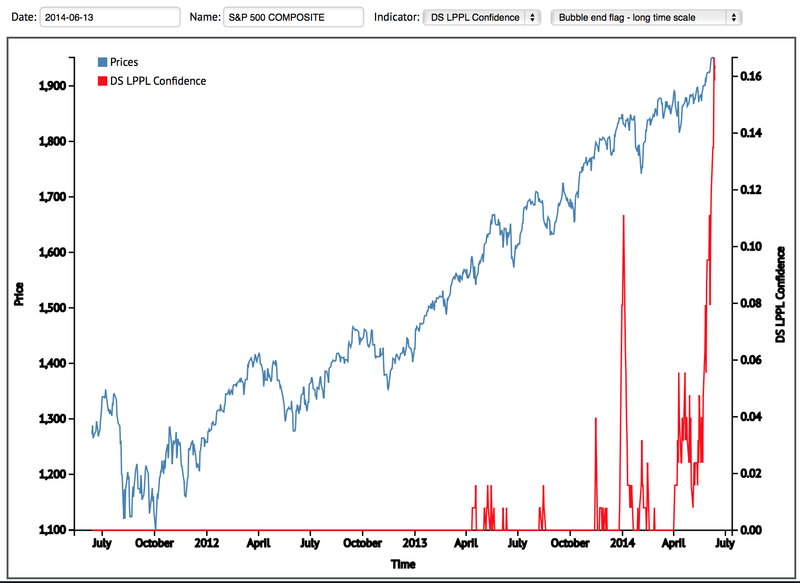 SP500: bulls still in charge, whilst put/call, vix and volume continue to warn of a likely pullback. 2. The speculative-target sectors and indices are still able to print double tops or lower highs here, there has been no breakout as yet: 3. 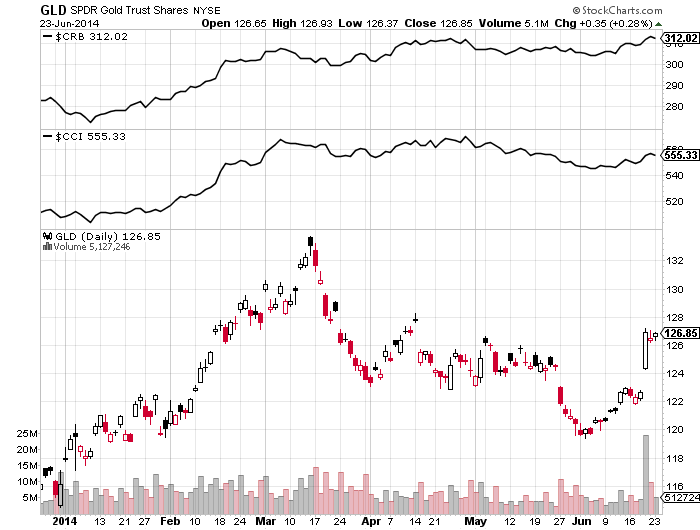 Gold, silver and miners got a burst higher last week. 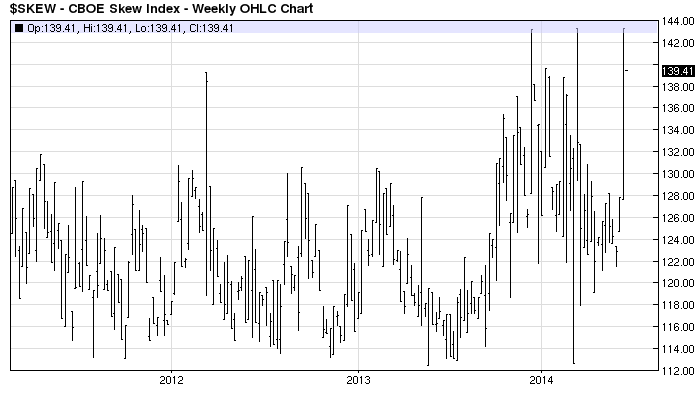 Needs follow through this week if not just a short covering rally. 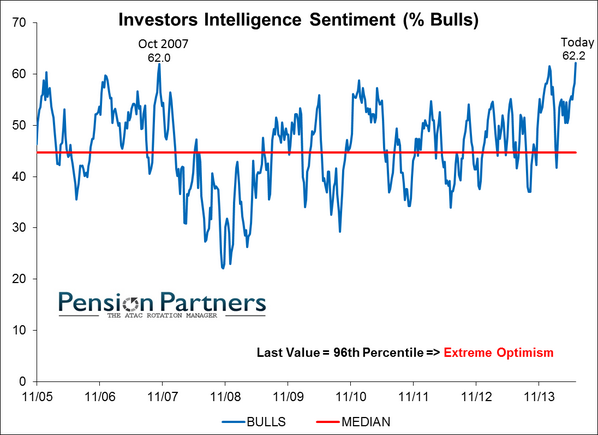 Plus, various sentiment measures still at high froth levels. 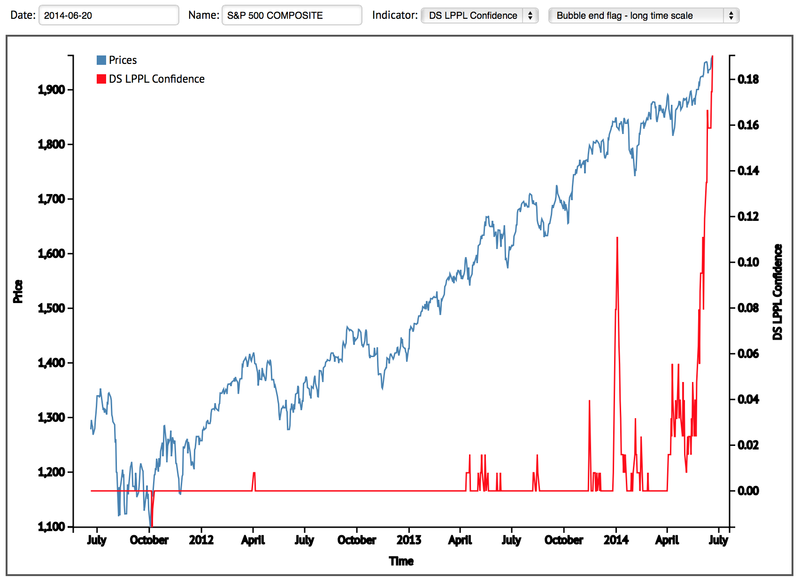 Sp500 is within touching distance of 2000, so maybe it can tag that before reversing. This Friday is the new moon, which is another potential top marker. Various indicators are repeating in June what they did in December-January, which was before the deepest pullback of the year, so maybe we finally see exhaustion here. I am holding my positions and watching and waiting. Wim Grommen argues there have been 3 industrial revolutions: 1780-1850, 1870-1930 and 1940-2000. 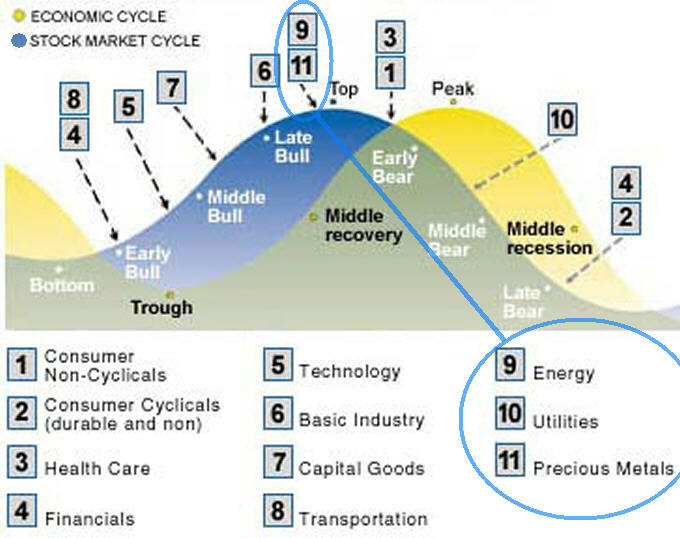 They terminated with major peaks in the stock market and then gave way to degeneration phases. 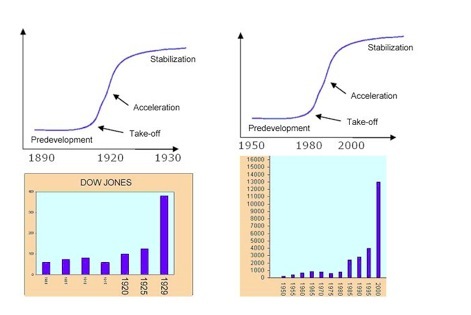 My perspective is demographic booms in the 1920s and in 1980-2000 made for economic and stock market booms, culminating in mania peaks at solar cycle maxima, and then giving way to prolonged economic downturns and secular bear markets once demographics turned. In short, the two periods rhyme. Parallels have been drawn between the Great Depression and the Great Repression in terms of severity of crisis, slowness of jobs recovery and bank failure risks. Similarly, central bank intervention became a dominant factor, with ZIRP and emergency spending programmes being required. 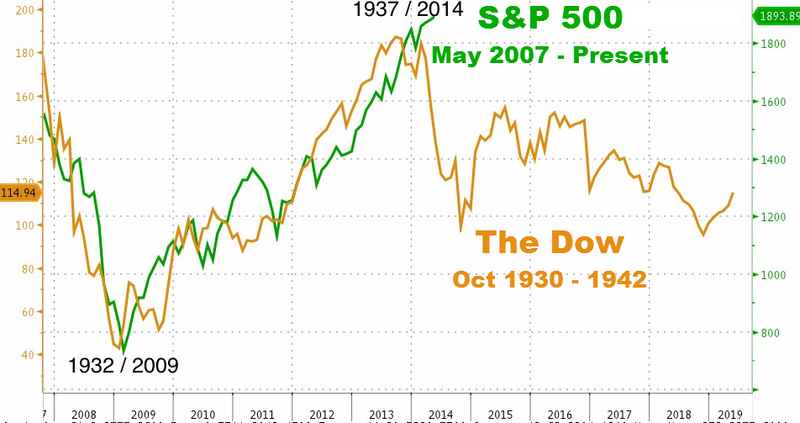 However, the Great Depression was much worse in impact when we consider number of failed banks, level of economic decline, drop in prices, and this despite the 2000 asset boom being a more extreme mania than 1929. One key reason for that was the aggressiveness of central bank response this time round, with more flexibility and conviction to draw down harder and faster on prosperity from the future. Central banks cannot overcome demographic trends and post-mania busts, but they can postpone their full impacts if they are prepared to pay for it, helping stop the devastation being so front-loaded. 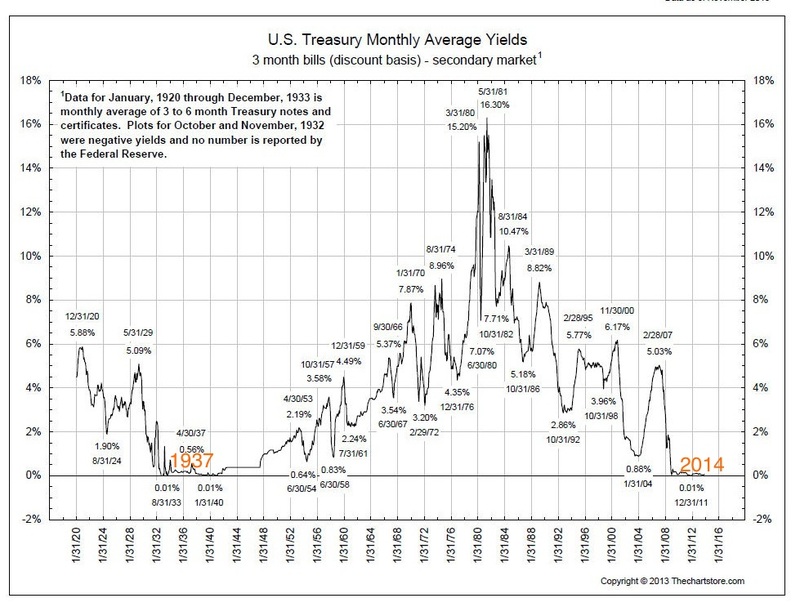 So, the bear market from 1929 to 1932 was totally devastating and took valuations straight to bottoming levels (shown at -56% below), whilst the 2000-2003 bear was halted at still expensive valuations. 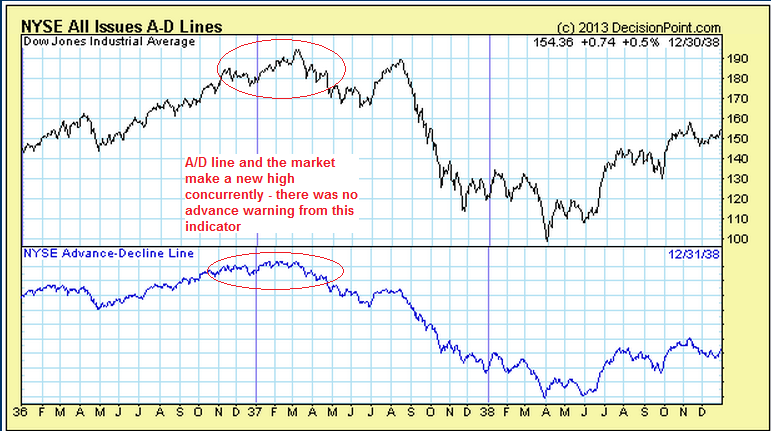 2009 then washed out valuations lower, and I believe we are on the cusp of another bear which will wash out properly. In other words, central banks have succeeded only in phasing the devastation, and the next leg down ought to be the worse: more of a deflationary depression. That projection can be cross-referenced with the demographic trends chart further up the page, and is further strengthened at a global perspective by similar demographic trends in Europe and China. 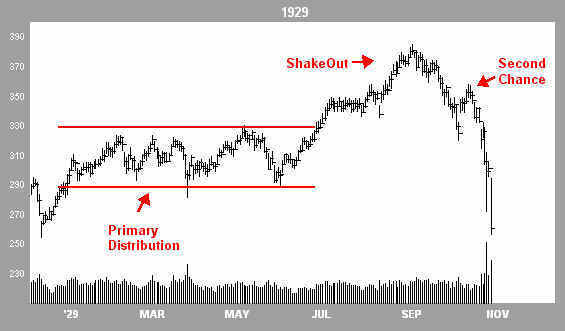 Between 1932 and 1937 a cyclical bull market erupted with distinct similarities to today (see post here). 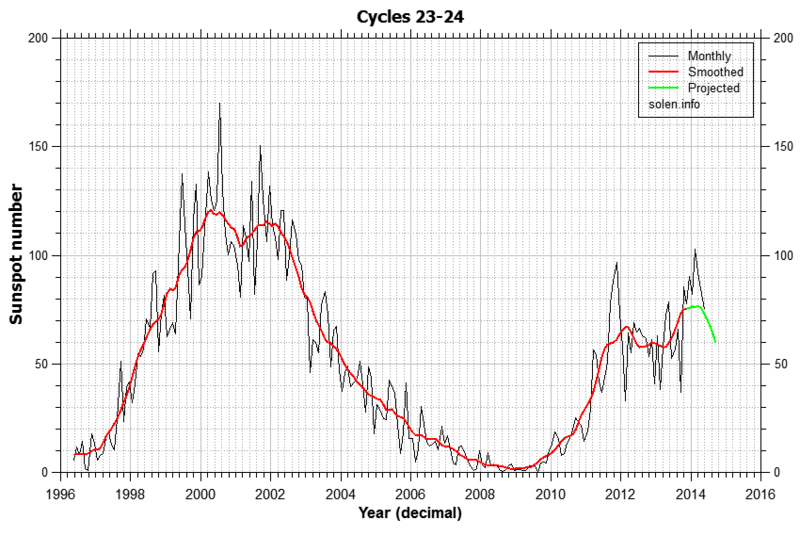 There was one solar cycle between the 1929 and 1937 peaks, and one between 2000 and 2014 (shown above). 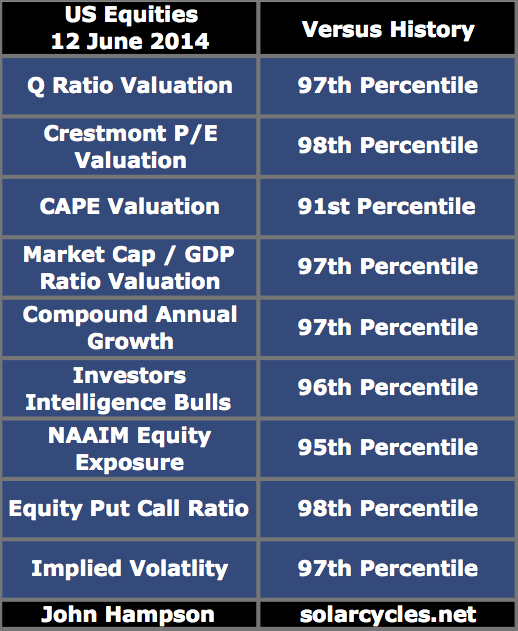 The 32-37 bull topped out along with the solar maximum in Spring 1937 with no divergence in cumulative advance-declines, which I believe will mirror today: an all-in peak at extremes in valuation, sentiment, leverage and complacency. 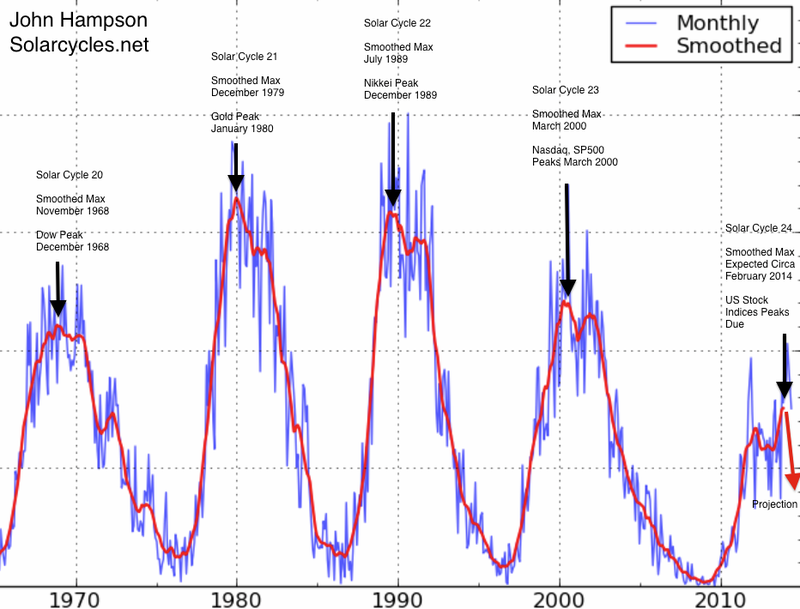 And this fits with solar cycle maximum peak-speculation timing. 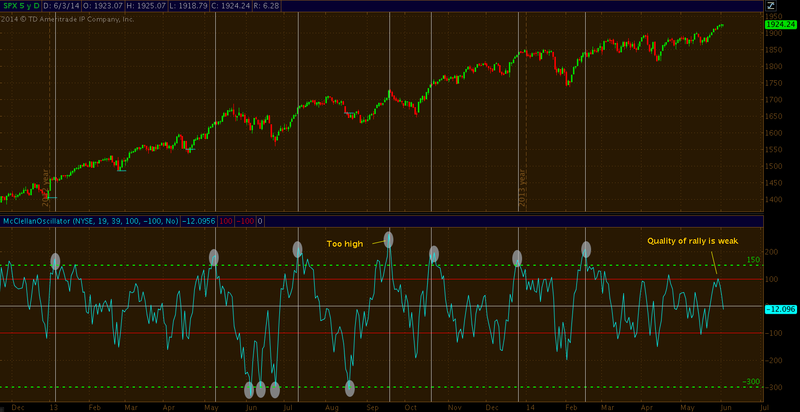 Friday’s session provided a bounce at the full moon. 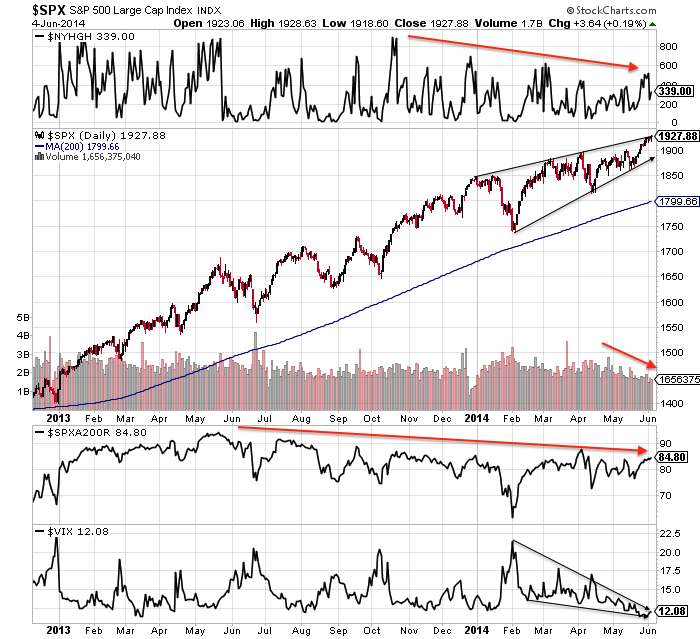 The bounce came at an important level in the large cap indices: a backtest of the ending diagonal or wedge. 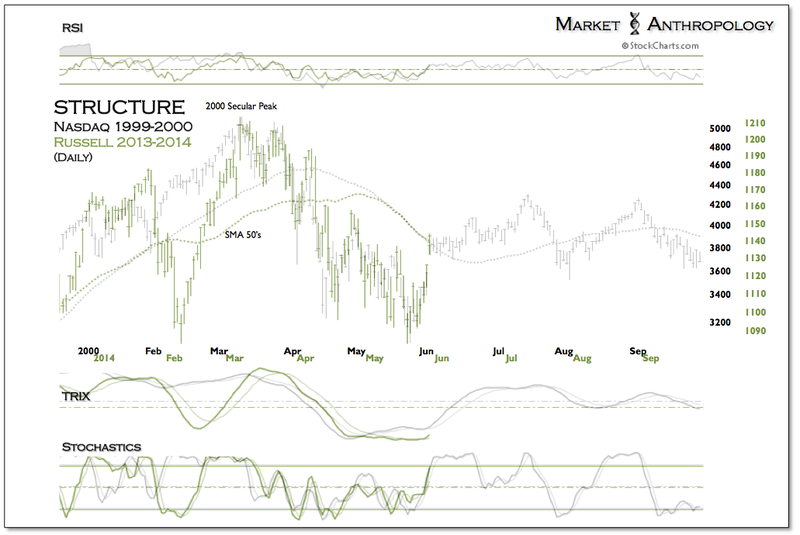 As full moons often mark inversions, that gives two reasons for stocks to rally again from here. 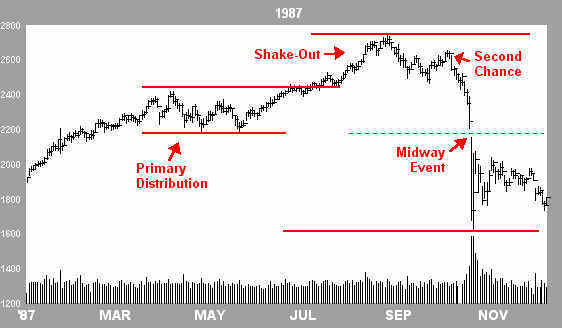 However, by various indicators further declines appear more likely, and such a development would then fulfil the ending diagonal overthrow pattern, whilst ensuring lower highs are maintained in the small caps. 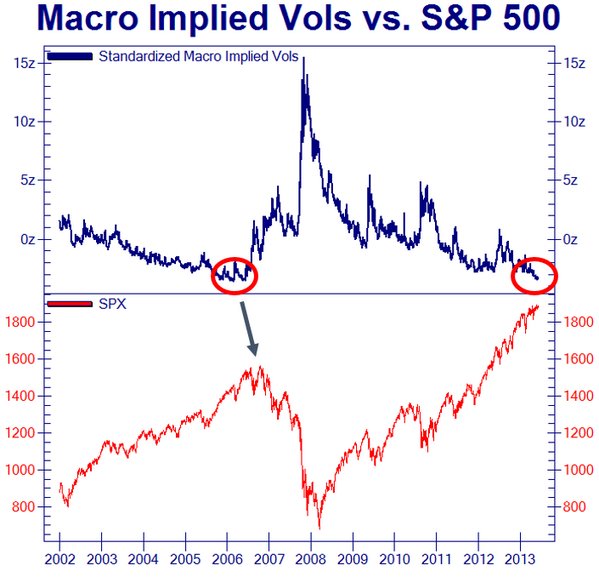 That would then enhance the likelihood of all the indices having peaked and the smoothed solar maximum having passed. Emerging new up legs in gold, miners and silver are another clue that could be occurring, whilst geopolitical developments in oil could be a catalyst to end the complacency. The best cross-referenced case I have currently is that the smoothed solar maximum, RUT, COMPQ, IBB and margin debt all peaked out around February/March. The majority of solar forecasts support this, and we have seen various asset peaks between December and June around this centre. 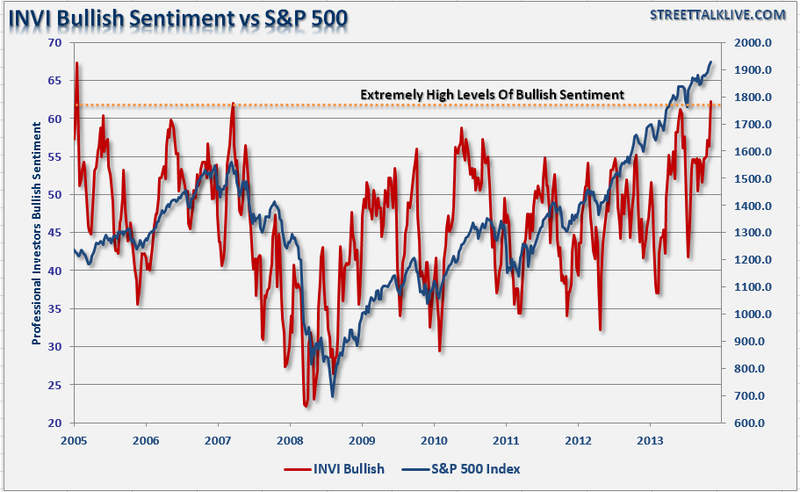 The Sornette bubble-end is flagging again here as sentiment, valuations and complacency are all at the level of extreme that would fit a reversal, plus certain divergences are mature. The selling on Wednesday and Thursday did little to reset the short term indicators that would suggest stocks rally again now. However, the risk remains that the solar maximum could potentially get stronger yet. 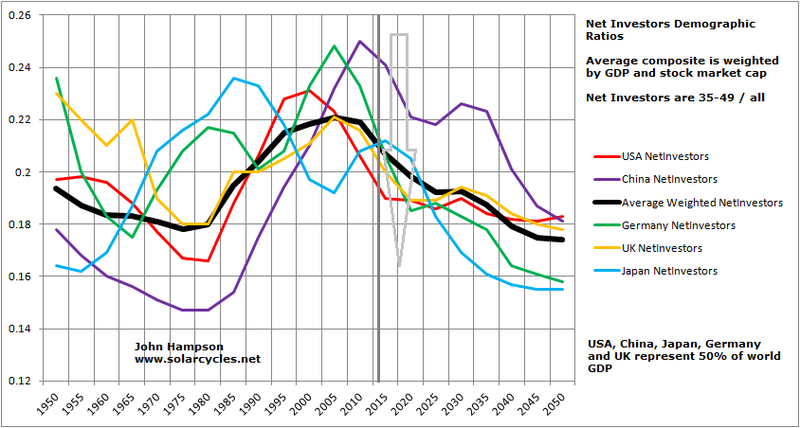 Solar scientists have not so far done great in their predictions for this cycle. They are generally united in projecting a waning sun for the rest of this year, but SIDC still continue to run with an alternative model which would delay the smoothed maximum until the end of 2014. Right now sunspots are high again as the sun has leapt back to busy in June after three months of waning, so I continue to monitor. Cross-referencing again, if the smoothed solar maximum were still ahead, then we ought to see large caps hold their breakout here and continue to advance, the other indices break upwards to new highs (invalidating their Feb/Mar peaks) and margin debt reverse its waning trend. So, as things stand, the highest probability case is for this to be the end of a topping process that began at the turn of the year, with the solar and speculation peak centred around Feb/Mar. 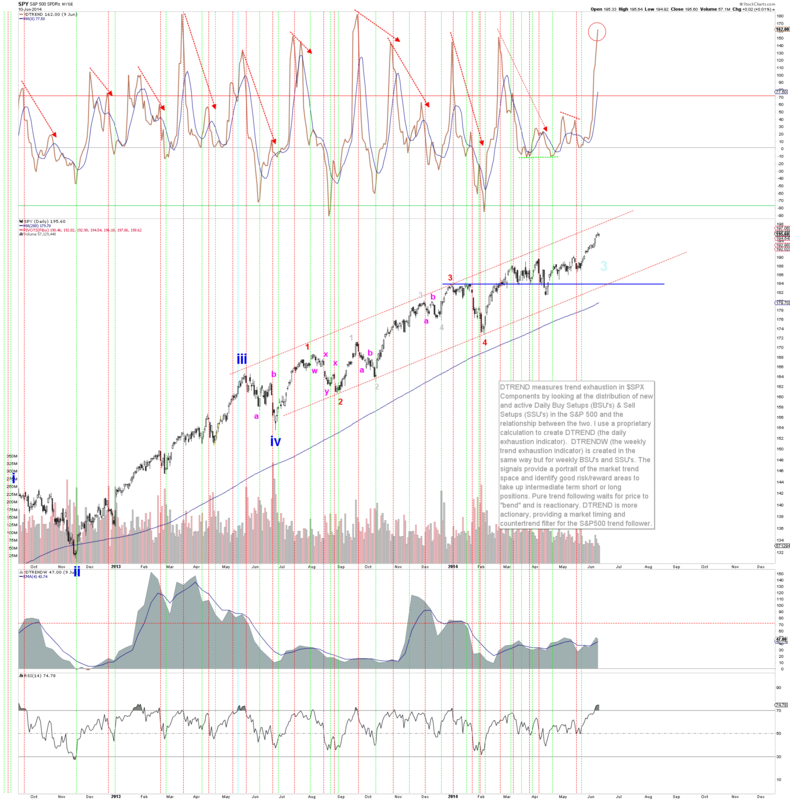 If so, then stocks should fall again this coming week, fulfilling the ending diagonal and bubble-popping, and completing the ‘second chance’ lower peaks in RUT and COMPQ. 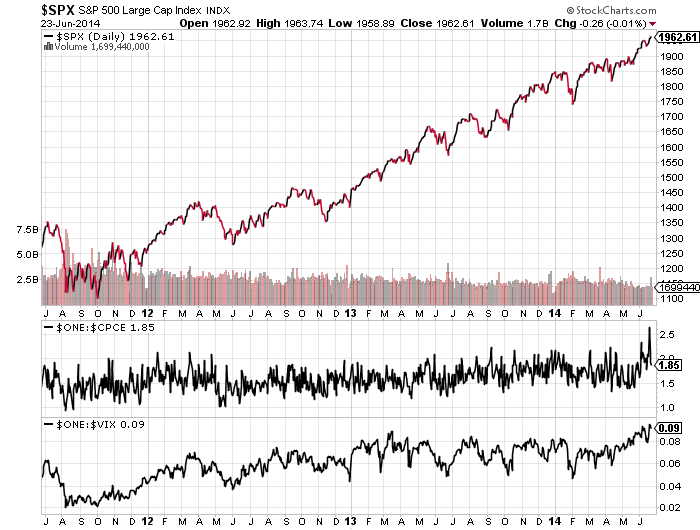 If instead the large caps hold the break and rally upwards, taking the Nasdaq Composite along to new highs in the process, then it would strengthen the case for the solar maximum and peak speculation to be shifted along to at least June, but potentially to even further out in the year. An important week. 9. A geomagnetic storm hit at the weekend and we are heading into this coming Friday’s full moon: twin negative pressures on sentiment. 11. 75% of companies in the US that have issued earnings guidance for Q2 2014 have issued negative guidance. 12. 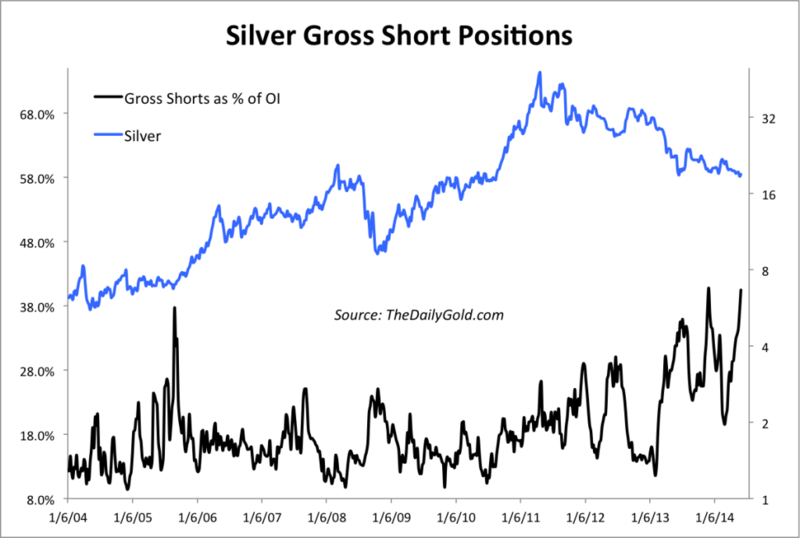 Gold and silver short interest at levels suggestive of a rally in precious metals, which would fit with a decline in stocks. In summary, it’s another compelling set-up. 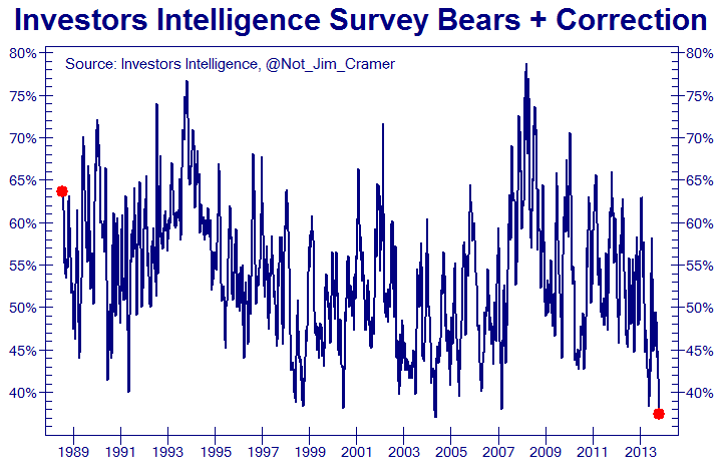 Whilst I cannot rule out stocks breaking higher and going crazier yet, I have to doubt whether sentiment, complacency and bubble/froth indicators really can get more extreme. 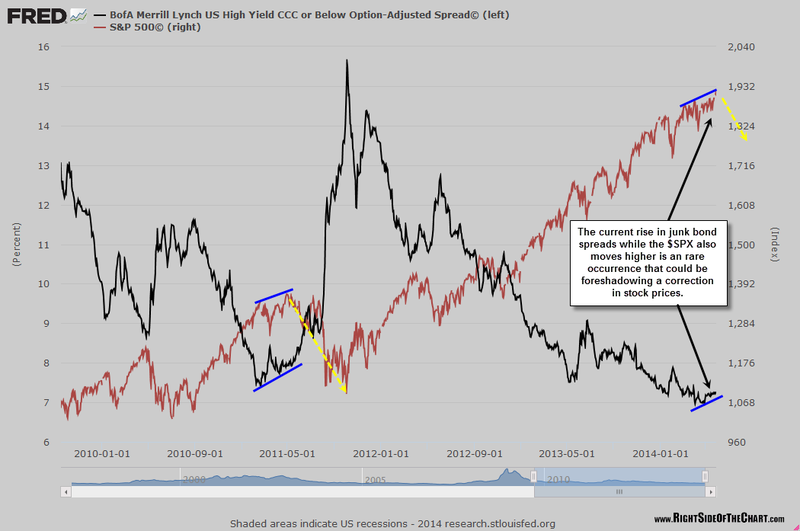 As per my Sunday post, Piecing It All Together, my primary case is for this being the last piece of the topping process, particularly so in honouring the combined February peaks in the sun, in margin debt, and in RUT, IBB and COMPQ, i.e. lower highs here are important. 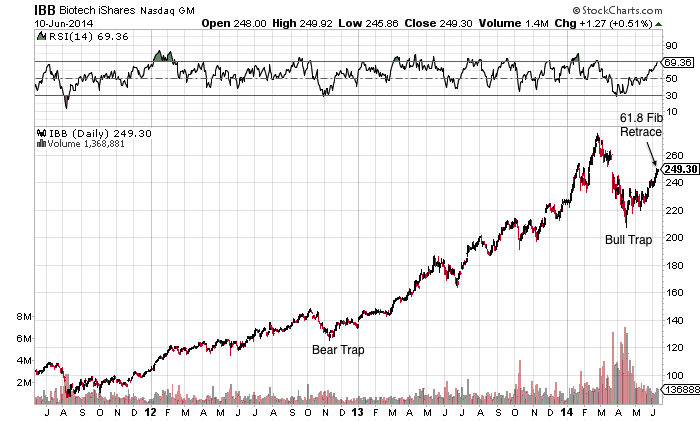 If selling can initiate here, then exit will be through a keyhole due the lopsided all-in extremes. 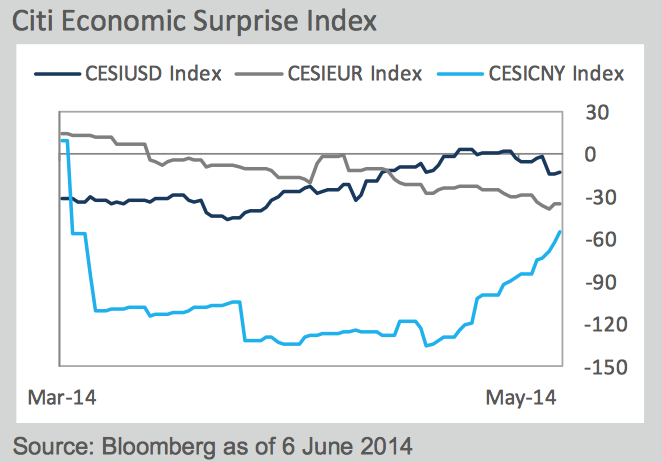 So, ECB decision today and US employment report tomorrow. 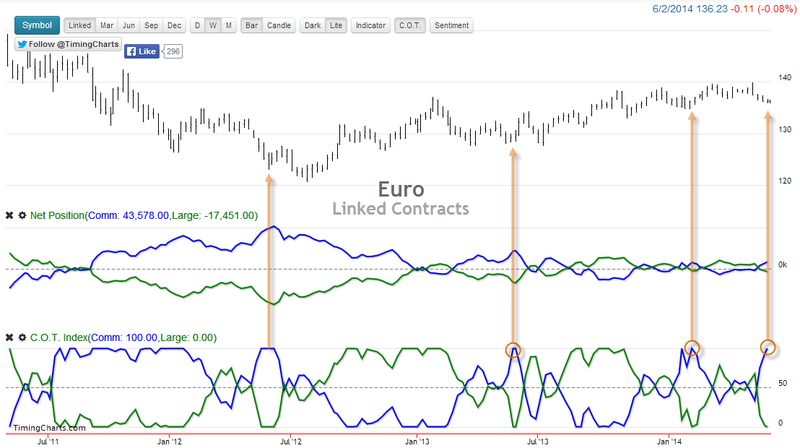 The Euro chart above potentially paves the way for ECB aggression disappointment (thus Euro rallying), which would fit with their conservative approach to date. Meanwhile yesterday’s ADP report paves the way for a potentially disappointing US jobs report tomorrow. 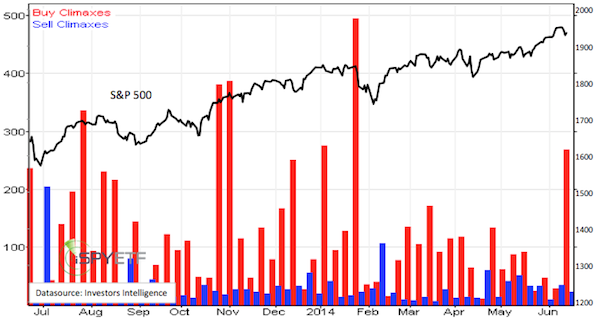 However, if news exceeds on either release then more short covering could propel equities higher. Pressure is downward from here into next Friday’s full moon. The combined picture, including the charts above, has set up another compelling chance here for the bears, so let’s see how the market reacts to the two news releases. 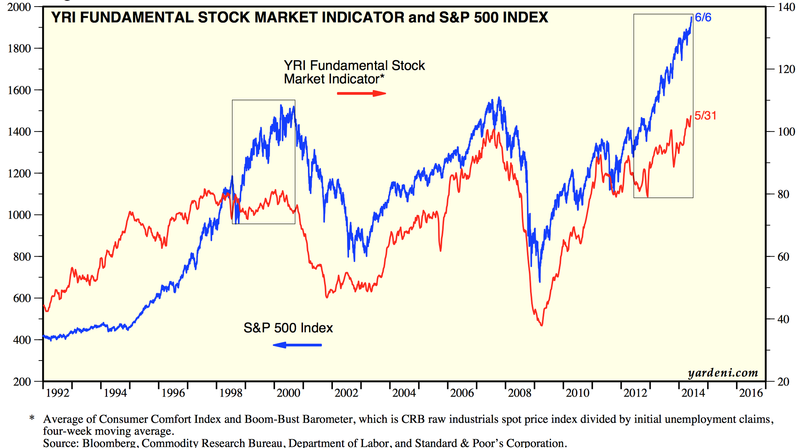 These various measures collectively suggest that the bull market is mature, that stocks are expensive, that investors are all-in and that we are looking at a major top. The only bigger mania in history was 2000, which, in contrast to now, had a demographic tailwind. There are three ingredients for a super peak: a solar maximum inspired speculation peak, a demographic peak (new buyers buying), and a leverage peak (same buyers buying more). 2000 had all three, but 2014 lacks the demographic tailwind, and for that reason we should not expect to reprint 2000’s all-time extremes. 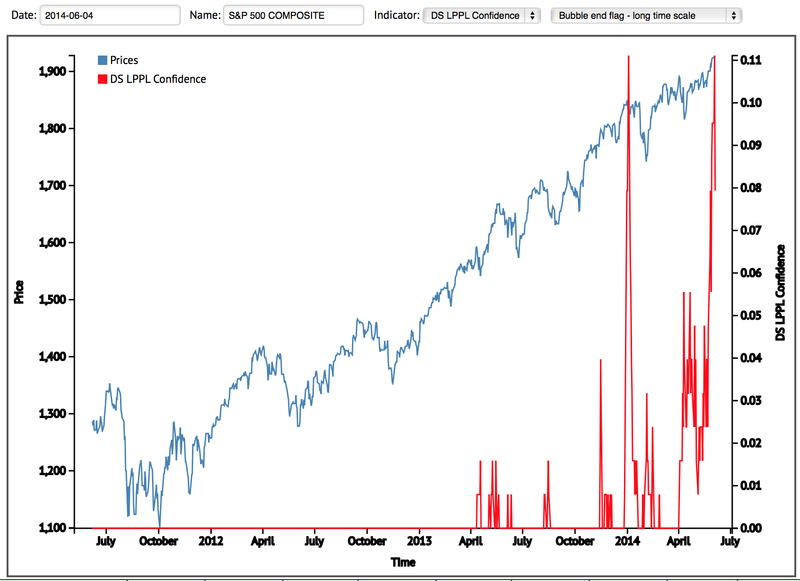 Over the last 18 months we have seen the requisite evidence of a speculation mania, inspired by the solar maximum. 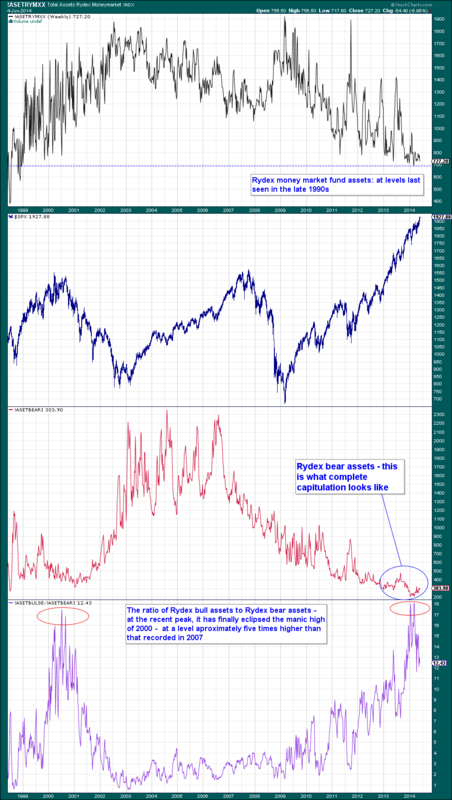 During that period we have seen the stock indices diverge from earnings, fundamentals (economic), and smart money flows, and we have seen sharp escalation in leverage (margin debt, Rydex leverage). 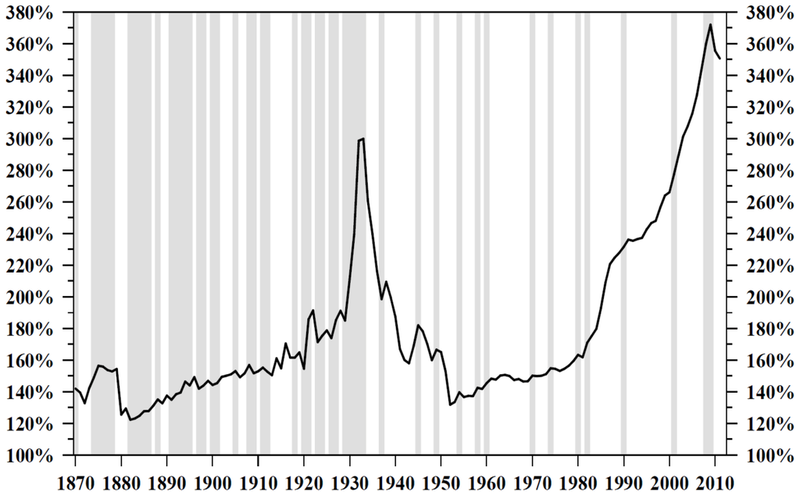 We reached dizzy valuations in small caps, biotech and social media, and by various measures, major stock index valuations already exceeded 1929 and 1968 peaks. 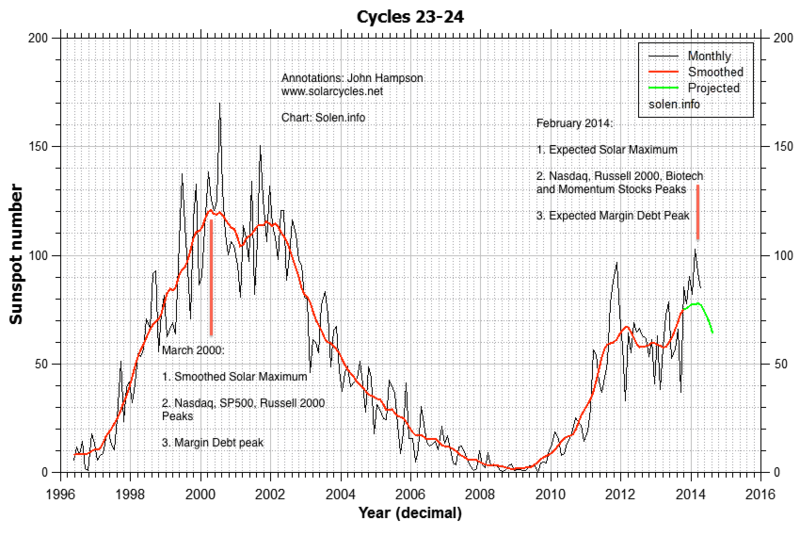 On current evidence it would appear the solar maximum peaked out along with the main speculation targets around February 2014, which is also when margin debt and net investor credit balances reversed. If stocks were to move materially higher from here, then we would need to see an extending solar maximum, a further reversal in leverage to print new extremes, and/or a stream of new buyers. 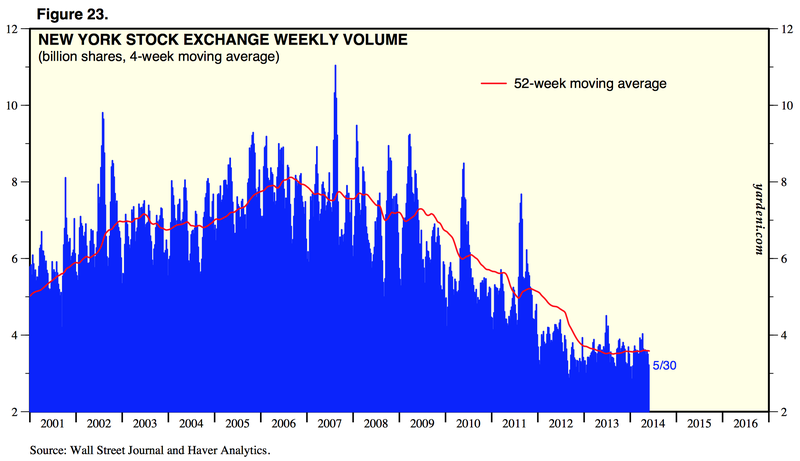 We see evidence for the demographic headwind in shrinking trading volumes, and if we couple that with the readings in household exposure to equities, fund manager allocations, and institutional versus private buying, which suggest saturation, I suggest it is unlikely that we have the fuel for another significant move higher in ‘new buyers’. 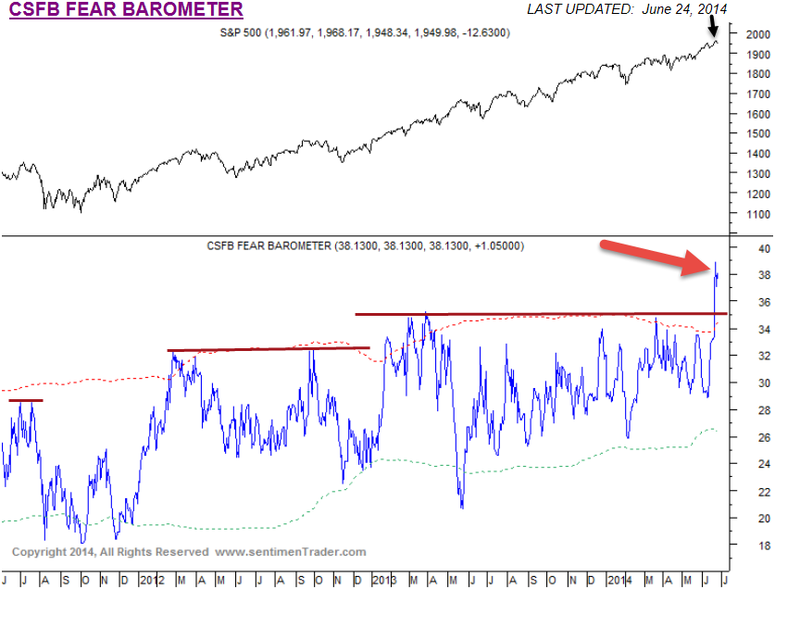 I then look at the extremes, spike and reversal in leverage and it is unlikely that increased ‘buying-on-credit’ can provide the fuel for another significant move higher from here. 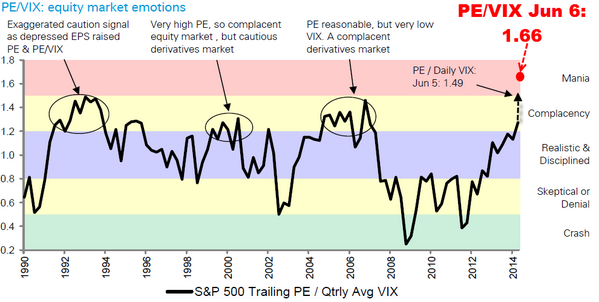 So even if the solar maximum were to extend beyond expectations then I suggest it is highly unlikely that equities would be bid up significantly higher from here, as if this were 1928, as both ‘more-buyers’ and ‘more-leverage’ look exhausted. 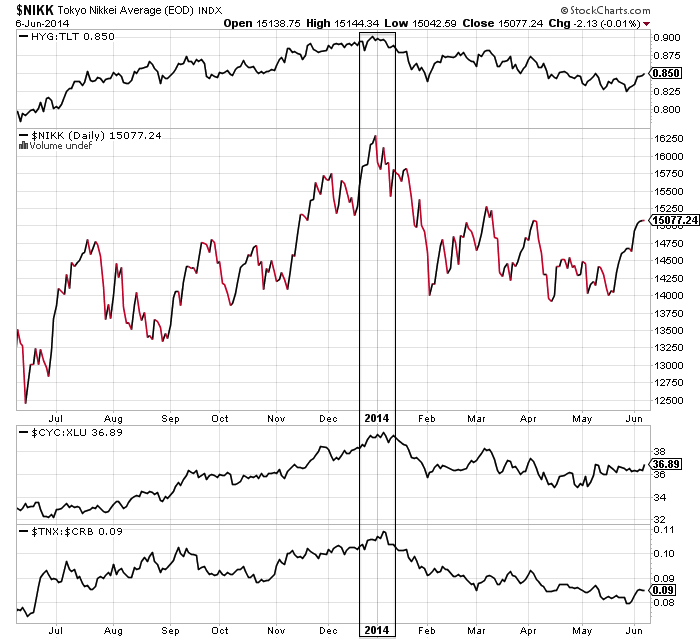 Since 2014 began, relative performance of utilities and treasuries, breadth loss in equities, and developments in sentiment have all echoed previous stock market peaks. 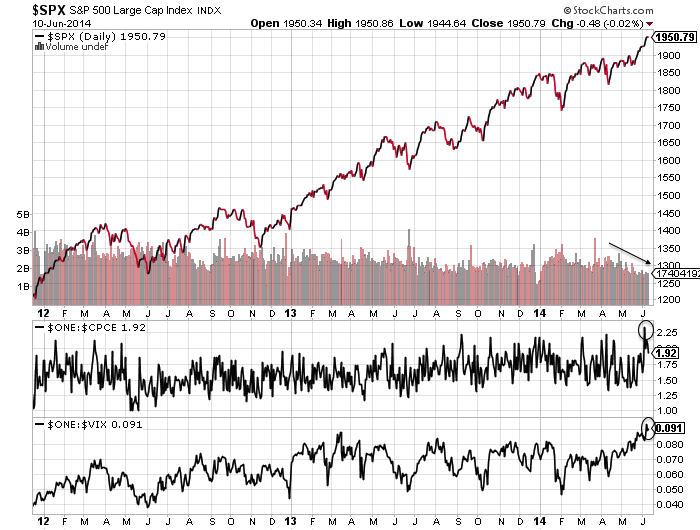 These warning signals are now mature and add to the likelihood of stocks breaking lower from here, not higher. 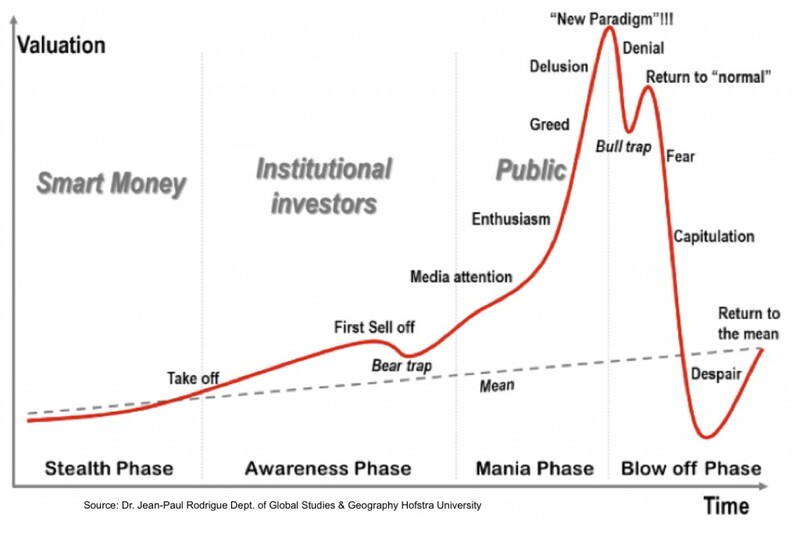 Not only that, but the combined settings of leverage, complacency, euphoria and levitation suggest that we are on a cliff-edge heading for a sharp crash. I’ve added short again on US stock indices as I continue to see a historic opportunity at hand, and I believe the evidence suggests there is little fuel for a significant leg higher. Rather, the evidence suggests that we are in the last gasp of a topping process.